Type 2 Diabetes is a nutritional condition and is NOT caused by insulin resistance. Repeat. Type 2 Diabetes is a nutritional condition and is NOT caused by insulin resistance. Today, on World Diabetes Day, I want to drive this message home. It is the single most important fact for the lives of the millions of Type 2 patients who suffer not just from the disease but from the effects of diabetic medications. Your body’s cells do not recognize insulin outside their cell walls. Insulin is a naturally produced hormone that tells cells that glucose is available to them, and normally, cells allow the glucose to enter when they detect insulin. But if the cells do not recognize the insulin, the theory goes that the glucose remains outside the cell, thus high blood sugar. Based on more than 20 years of studying the literature on insulin resistance, I have concluded that this theory is illogical and biologically unsound. I can provide many reasons that demonstrate why insulin resistance is not taking place in your body. In place of that theory, which has not been scientifically proven, I have recognized that another more logical cause of high blood sugar. My theory is supported by the following factors. Diabetes is increasing in every country where grains have become a large portion of the diet. Younger and younger children are developing Type 2 diabetes and some women develop gestational diabetes during pregnancy and then lose it within days of giving birth. The consumption of grains causes a normal body metabolism–the burning of fatty acids rather than glucose in cells–to go haywire to the point that your body regularly uses the fatty acids produced from grain carbohydrates rather than burning glucose. The answer is YES, absolutely. If your doctor agrees with insulin resistance, it is very likely you will be prescribed medications to boost your body’s insulin production. 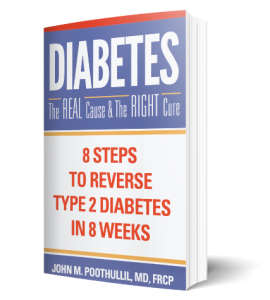 This method of managing diabetes, in fact, makes no sense because if you are resistant to insulin, why introduce more of it? Doesn’t the entire medical community agree that insulin resistance is the cause of Type 2 diabetes? YES, currently insulin resistance is a widely-held theory. Endocrinologists have persuaded other medical practitioners and the public to accept the idea that regardless of age, body-mass index (BMI) or gestational status, patients suddenly develop a resistance to insulin in their liver, fat cells, and muscle cells, which leads to the cells not being able to accept glucose, leaving it in the bloodstream. Should you ask your doctor to investigate “insulin resistance” before prescribing medications? The acceptance of this theory by the medical community legitimizes the treatment of diabetes to be based on controlling blood sugar using drugs. Medications often make patients complacent about making the lifestyle changes necessary to keep blood sugar level within normal limits without the use of drugs. Over time, many patients on drug therapies must therefore increase their dosages or even begin injecting insulin, because they are wearing out their pancreas prematurely. Numerous complications can result from the ongoing use of drugs, rather than learning how to eat properly to avoid diabetes. Yes, I think every type 2 diabetic and pre-diabetic should be demanding from their doctors that more research must be done to prove this insulin resistance as the cause. The real tragedy of using medications to control Type 2 diabetes is that it engenders fearful decision making. Patients are usually given the scary news that they have an “irreversible and incurable” condition called insulin resistance. Patients are told Type 2 diabetes is a “progressive disease,” meaning that it’s consequences worsen over time. Experts presented these messages as if they are clearly understood, but in reality, cannot prove them scientifically. Fearing a corollary problem, hypoglycemia—compels patients to eat even when they are not hungry, or to eat more than they need to because their medical caregiver told them to do so. Many medical practitioners encourage diabetic patients to check their blood glucose level daily at home telling them that the more accurately they know their blood sugar level, the better they can control it. However, there are no studies showing that regularly checking your blood sugar level at home results in better long-term maintenance of the blood sugar levels, a lower incidence of hypoglycemia, or fewer complications of Type 2 diabetes. My view is that treatment for Type 2 diabetes should be based on achieving beneficial outcomes. These include the reduced risk of having problems related to the heart, eye, kidney and other organs—not any supposed evidence that your blood sugar values have declined. Many people taking diabetes medications to lower blood sugar still end up with lost eyesight, amputations, kidney disease, or other serious complications. If you are seeking to treat diabetes, a reversible condition, it is important to eliminate grains and grain-flour products from your diet. Avoiding grains and grain-flour products, on the other hand, reduces the accumulation of fatty acids flowing in the bloodstream, so your body can revert to the normal pattern of burning glucose in your muscle cells. You will thus put an end to the fatty acid burn switch, lowering the level of glucose in your blood. If you have been recently diagnosed with Type 2 and would like to be medication & diabetes free, I recommend you relearn how to eat for health while enjoying your food! Think of the joy you will experience to be able to eat when you are hungry rather than on a schedule. Be able to skip a meal if you want without having to worry about the serious consequences of hypoglycemia. Avoid the complications caused from keeping up with your medications. I invite you to watch this short video I made about insulin resistance– and then to read my book Diabetes: The Real Cause and the Right Cure, where you will find a comprehensive explanation of why my theory about diabetes is far more biologically sound than insulin resistance. Download the Kindle version for only $.99 cents in the month of November!